Fleur and Drew came to me when they were planning their Spring wedding at The Tythe Barn. They wanted a lush and pretty wedding which reflected their gorgeous countryside setting and love of flowers. And with a name like Fleur there was always going to be a lot of flowers. Fleur and Drew wanted a late Spring mix of fluffy blooms and loved the idea of a ‘secret garden’ look. We went for a pastel mix of pinks, peaches, lilacs, blues and whites. Arrangements were full of lilacs, anemones, garden roses, cherry blossom branches, jasmine and ranunculus. Bouquets were loose and informal tied with silk ribbons. Fleur’s garden cascade bouquet was lush, light with lots of natural movement from the jasmine and clematis. And her bridesmaids carried delicate scoops of lilac, roses, broom and anemones. This was one very pretty wedding with archways, hanging flower branches and flower filled candelabras. 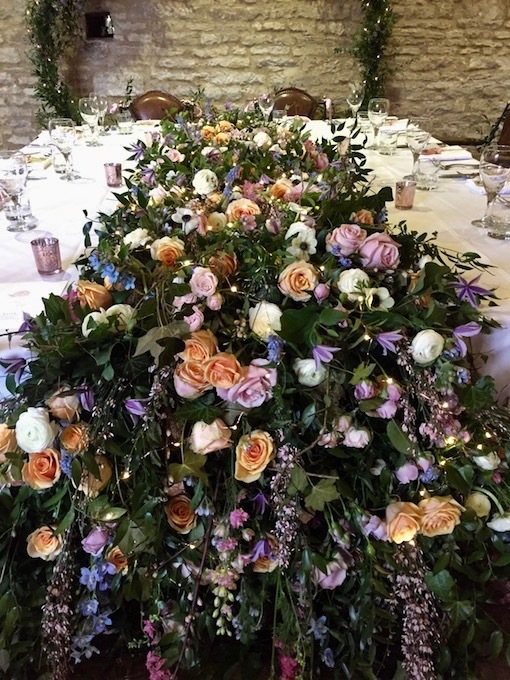 But the star of the show had to be the cascade of flowers on the top table. carpet of flowers was laid right along the table dripping down to the floor. This stunning statement piece was an absolute dream to design and make. Hundreds of flowers were used to decorate the flowery carpet along with intertwined copper wired fairy lights which gave it a beautiful sparkle as the sun went down.